Actually, Caltrain has two dwell time problems. The first is that station dwell times are too long, and the second is that station dwell times are too unpredictable. Both of these problems will prove fatal to the blending of Caltrain and HSR services on "primarily two tracks." In one hour, six trains can arrive in San Francisco. Our string diagram is full of gaps, which means we are making very poor use of the capacity of our single track. How do you fix this? If you compare it carefully to what we had before, we can now fit eight trains in the span of one hour, instead of six, because those dreaded gaps are shorter. By increasing the average speed of the locals, we were able to squeeze in more trains (and more passenger capacity). Caltrain seems content to declare victory and live like this happily ever after. This is what they envision as the "blended system". Whenever Jane decides to ride the train, the pink padding still ensures that following trains aren't delayed too badly. It's better, but still kind of mediocre. Especially for Jane. If the local arrived in San Francisco ten minutes earlier thanks to electrifying Caltrain, it can arrive another five minutes earlier than that by having level boarding at all stations. Electrification saves time between station stops, and level boarding saves time during station stops. The two work together as perfect complements to each other. Caltrain commissioned a study of station dwell times, which found that across a sample of 5149 station dwell observations, the median duration from wheel stop to wheel start was 49 seconds. The median excludes abnormally long dwells, such as those occurring when Jane wants to ride. The average dwell time does account for Jane and is 58 seconds, practically an eternity. That was back in 2010. Today, with the system bursting at the seams, average dwells are getting so long that the timetable was recently adjusted to make chronically late trains into slower on-time trains. With level boarding, typical dwell times could easily be cut to 30 seconds. We're really cooking now. We can squeeze 12 trains through in one hour on the same track. That represents a massive capacity increase, with the combined effect of reduced and predictable dwell times providing a similar benefit as electrification alone did. First of all, they don't even call it level boarding. Dual doors! What a pain! Requested by interloping stakeholders, or imposed by those annoying HSR people! Ew, it's so complicated! It costs $30 million to equip the new fleet! It's almost as if they are disowning the very idea of level boarding, and reluctantly trying "not to preclude" some unspecified future decision because this stuff is just too hard to think about. Presented this way, you couldn't blame the board or the public for thinking this is a stupid idea. Where's the upside? 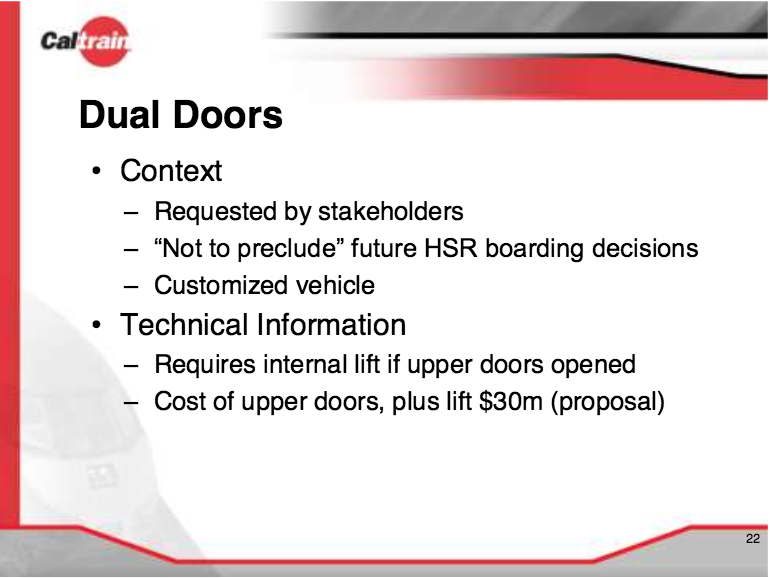 The upside is this: dual doors are the only realistic path for Caltrain to achieve level boarding, and level boarding is the only way that the blended system can work on "primarily two tracks." This issue cannot be taken lightly, because the next opportunity to start a Caltrain conversion to level boarding will not occur until 2050, when the new fleet reaches the end of its useful life. That's because the new fleet, as about to be ordered, cannot provide level boarding at a platform height of 25 inches. The entire system would have to be shut down for the trains to be modified and all platforms to be rebuilt at that height. So, doing nothing today and blindly kicking the can down the road until 2050 is not an option. A prudent and strategic $0.03 billion down payment for a gradual transition to level boarding is minuscule as a fraction of the $2.2 billion modernization budget, and unlocks great potential for quicker and more punctual commutes as soon as the next decade. 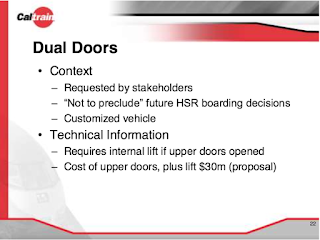 Dual doors are a customization that amounts to less than 5% of the price tag for new trains ($30 million out of $648 million bid price). They can hardly be used as an excuse for the massive increase in the cost of Caltrain modernization. They will help to address Caltrain's dwell time problem. Caltrain has a dwell time problem. The first step is for everyone (staff, board and public) to understand it.